If you're an early riser, you may have noticed Venus shining in the eastern sky brightly just before sunrise. Look a little closer, and you'll also see Jupiter just above it. On Sunday morning (July 15) the waning crescent moon will join them, weather permitting. But wait, there's more. This celestial gathering is taking place in front of the constellation Taurus. 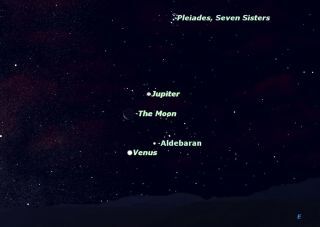 Close to Venus, Jupiter and the moon is the bright red giant star Aldebaran, surrounded by the stars of a star cluster called "the Hyades," 153 light-years away. Aldebaran is not a member of the Hyades, but is much closer to the sun, only 65 light-years away. Just above this rather loose group of stars is a more distant cluster, the Pleiades, 425 light-years distant. Two of the closest star clusters to our sun, these make an interesting contrast. Because it's closer, the stars of the Hyades are more spread out. The Pleiades are passing through a nebula in the night sky at present, which can be seen in photographs, and even in binoculars under very dark skies. Over quite a large part of the Earth, from the eastern British Isles across most of Europe, northern Africa and Asia, observers have a chance to see the moon will actually pass in front of Jupiter, an event which you can get a preview of in this video simulation of the Jupiter-moon meet up. For stargazers in North America, we will see a near miss as the moon passes close to Jupiter. The waning crescent moon will be only a few days short of new, and the part of it unlit directly by the sun will be glowing in earthshine, sunlight reflected off the almost "full Earth" in the moon’s sky. Over the next week the moon will move through new moon phase, passing the sun, into the evening sky, where it will join with Mars, Saturn and Spica for another quadruple conjunction. Editor's note: If you snap any amazing skywatching photos this summer that you'd like to be considered for use in a story or gallery, please send them to SPACE.com managing editor Tariq Malik at tmalik@space.com.